According to historical sources, in 1385, during the reign of Charles II of Navarre, bullfights were already being held in Pamplona. Although these fights were different from the present-day ones, they did mean that the bulls had to be brought to the square to be "fought" or "played with" although they were never actually killed. At that time, the bulls were led on foot through the fields to the city. The final stage of the journey, which went through the streets, was made in the early hours of the morning so as to not to be a nuisance to the inhabitants. 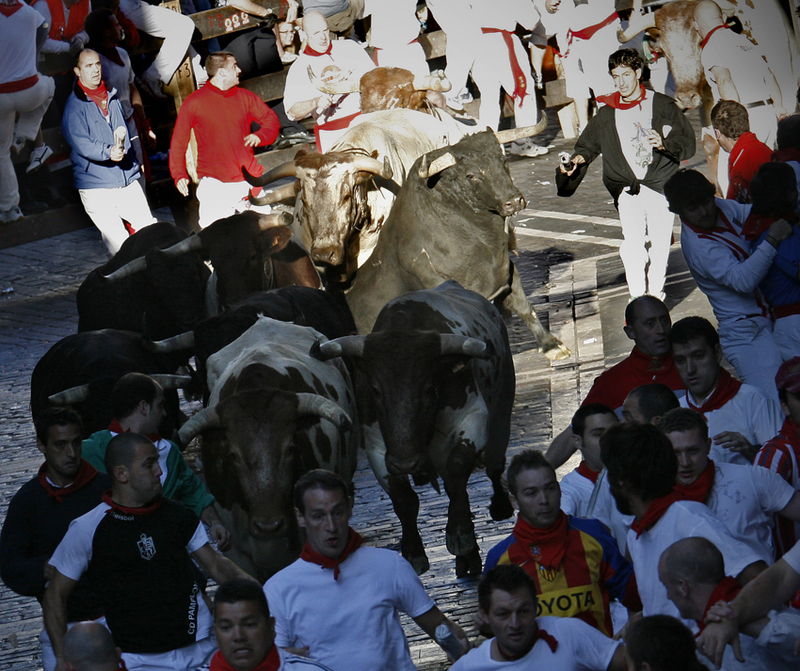 During this final stage, the bulls were run through the streets, urged on by the herdsmen wielding their sticks behind. If we accept that the bull running developed as a result of people accompanying the bulls through the streets as they were being taken to the square, it can be deduced that at least 600 years' ago the bull running was already at its embryonic stage. And perhaps there was also a further "Desencierro" when the bulls would be accompanied back through the streets out of the city, as they were not then killed in the square. Those Encierros (bull runs) which were called "Entrada" (entry) bear little resemblance to present day ones. A man on horseback would canter ahead, informing the locals that the bulls were on their way, and a few young people ran at a certain distance from the herd, acting in direct contravention of the council's orders. The Town Hall has always considered the Encierro as a non-respect of authority and the lesser of two evils, and therefore although the running was officially prohibited in actual fact it was accepted. Until 1843 the bull running ended in the Plaza del Castillo square, which was made into a makeshift bullring for the San Fermin fiestas. The bulls did not run along the street of Estafeta until 1856. In fact, over a 13 year period, the bull running had four different routes, entered by two different medieval gateways, and ended in three different bullrings. With the development of the railway, the bulls started to be transported by rail, making it unnecessary to bring them across the fields and run them through the streets. These circumstances would have led to the disappearance of the Pamplona bull running. However it was continued thanks to the widespread support of the locals, who were always opposed to the authorities' desire to prohibit it completely. As a result, in 1867 the City Council issued the first edict regulating the bull running - setting the time, the route and the internal rules. As the Council had been unable to stop the running from happening, it decided to regulate the event and legalise it. The final great change to the bull running route occurred in 1922 when the present-day bull ring was inaugurated. The route now turned left instead of right at the end of the street of Estafeta.